Argentinian Horned Frog's are one of the largest amphibians, growing to an adult size of 100-150mm and weighing up to 2Kgs. They eat what ever they can fit in their mouth, be an insect, frog, mouse or even small lizards! What does a Horned Frog look like? These "Mouth on Legs" as people call them, are basically that! They have small legs and eyes that protrude from the tops of their heads, but they are mainly just mouth and stomach! There are many colours and patterns ranging from greens with bright red markings to dark green/browns with black. With controlled breeding,Albinos are also available and these look great. When you see these little chaps for sale, you may think "aren't they cute!". Yes they are, but they grow to a size of 100 - 150mm, they are as wide as they are long. Adults weigh up to 2kg - that's two bags of sugar. They also have teeth along the bottom jaw, so watch your fingers! Where are Horned Frogs from? Different species of horned frogs range throughout America. Below are the species name and areas that they can be found. Ceratophry aurita - Minas Gerais and Bahia to Rio Grande do Sul, Brazil. In the wild, this large frog would lay in wait for prey to walk past, they rarely move about. They camouflaged theirselves among leaves and debris on the junbgle floor so they can hardly be seen by preditors or prey. 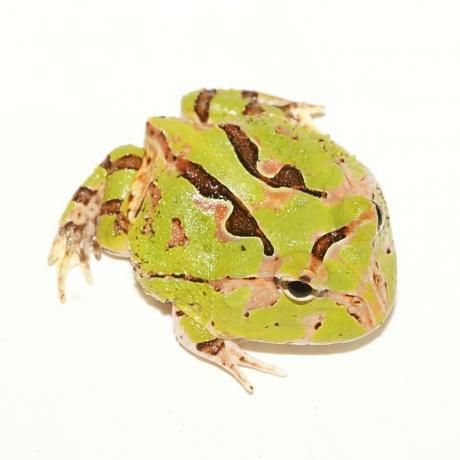 Their diet mainly consists of other frogs, but large insects, rodents, sankes and lizards will be eaten. They will tackle any prey of their own body size and if threatened, they use extreme aggression and are willing to attack the animal many times its own size and bulk. They are surprisingly fearless, even jumping toward the enemy and biting. 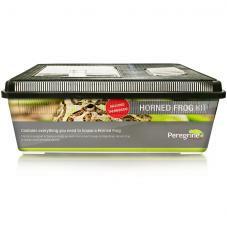 How do you keep Horned Frogs? You can keep them in plastic tanks, with a soil substrate covering the bottom, thick enough for them to burrow into. Place moss over half of the substrate and a shallow dish of treated water, deep enough to cover half of the frog. You will find that the frog will just sit and wait for food to walk past them. This is one of the reasons why they are so big and fat! They like a temperature of 25 - 28C (77 - 82.4F), so you need to provide them with a heat source. We keep ours in a very warm room, I would recommend using a small bulb above the tank or a heat mat on the side of the tank. Caution must be taken not to dry out the substrate when using the above heat source. 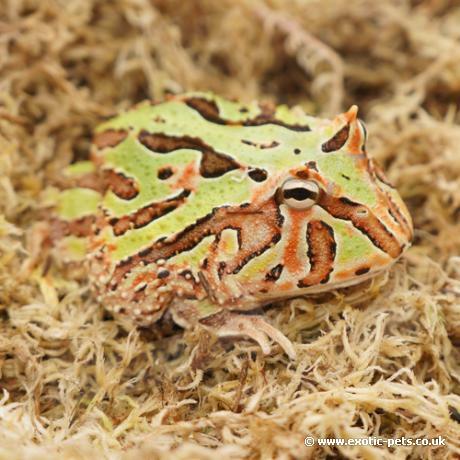 Spray twice per week, but if the tank becomes too dry the frog will dig into the substrate and cover themselves in mucous. A range of insects can be purchased from either your local pet shop or via this site (see live food list). Dig up earthworms and buy some frozen mice, this will keep the diet varied as much as possible. Growing frogs should be fed every day and adults a few times a week. Caution must be taken not to over feed the frog, as these will keep eating!